This bundle comes for the lovely Kari McKight Holbrook. 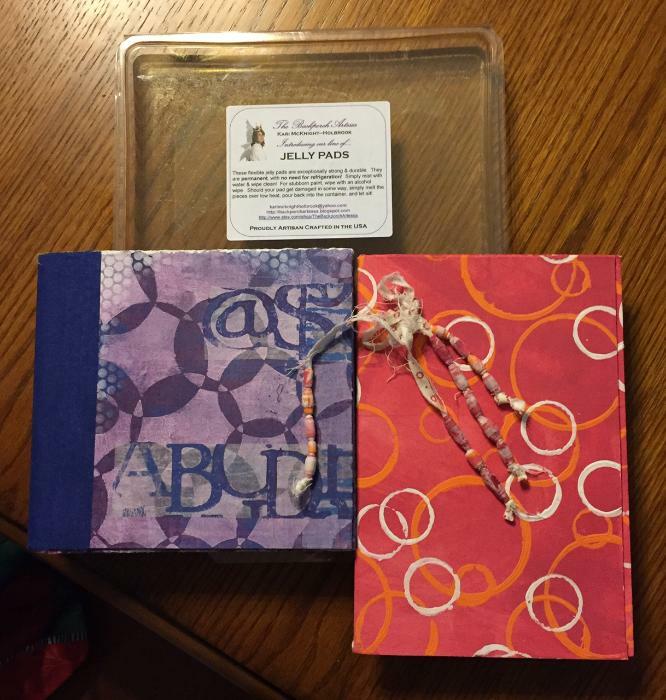 She made the Jelli print which measures 8in x 10in and is approximately 3/8in thick. The Jelly pad is flexible and exceptionaly strong and durable. They are permanent, with no need for refrigeration. Simply mist with water and wipe clean! For stubborn paint, wipe with alchol wipe. Should your pad get damaged in some way, simply melt the pieces over low heat, pur back into the container and let it sit. Try it for mixed media art, card making, quilt making and more. It's also a great, economical choice for beginning printmakers and students.The same item goes for $30.00 retail.